Railroad place names have a way of outliving the things after which they are named. So it will likely be with Du Pont, which was named for the chemical plant that stood here for close to half a century. The plant closed at the end of November 1998 and demolition of its structures began around March 1999. Soon folks will have forgotten the days when tank cars were lined up by the dozens in the yard outside the factory gates, or the little Alco S4 switcher that once made daily appearances here. 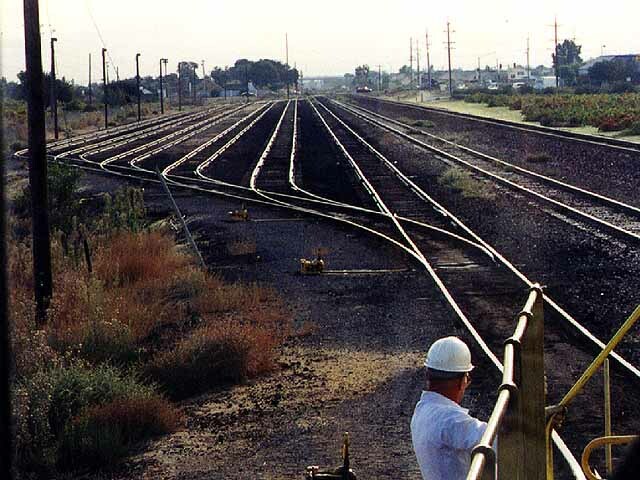 Although you will find some pictures of the Alco and the tank cars here, this page is more about the other things one can see along this mile-long stretch of track that runs between Oakley's Big Break Road crossing and the Highway 160 overpass. Currently home to grape vineyards and almond trees, the Du Pont property is still a scenic oasis in the rapidly developing suburbs of eastern Contra Costa County. Don't take it for granted, though, because once this property has been cleaned up and sold it will be a prime candidate for development. For more on Du Pont's switching operations, check out our Du Pont documentary page. It is February 1999 and spring is in full swing around the Delta region. 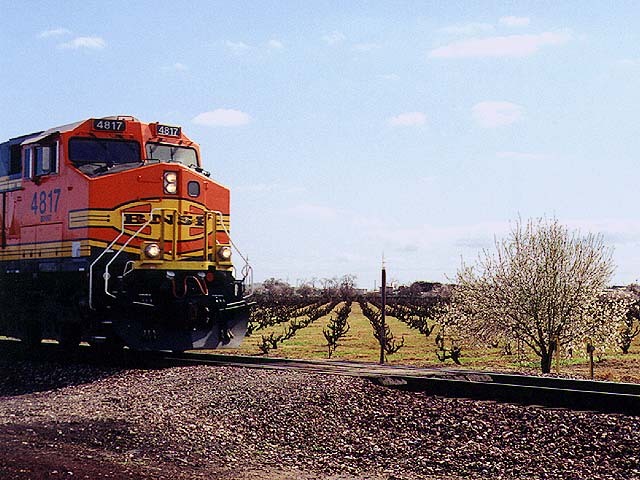 Here, westbound BNSF 4817 passes a blooming almond tree at an unmarked crossing at MP 1148.0. Photo by Glenn Gehlke. 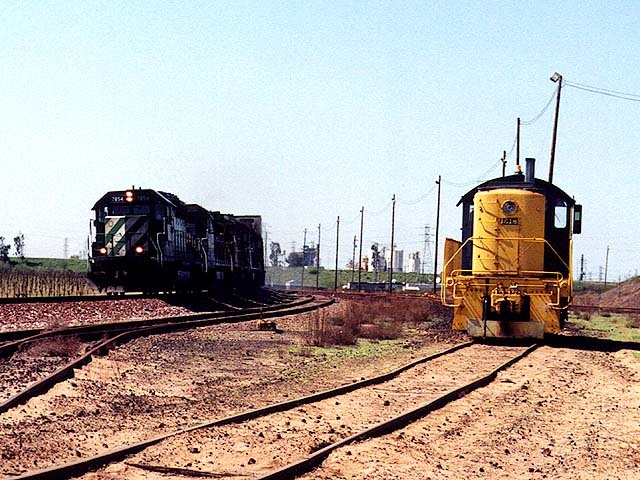 Mount Diablo provides a stirring backdrop for Du Pont 1518 as it kicks cars in the west yard on Nov. 2, 1998. 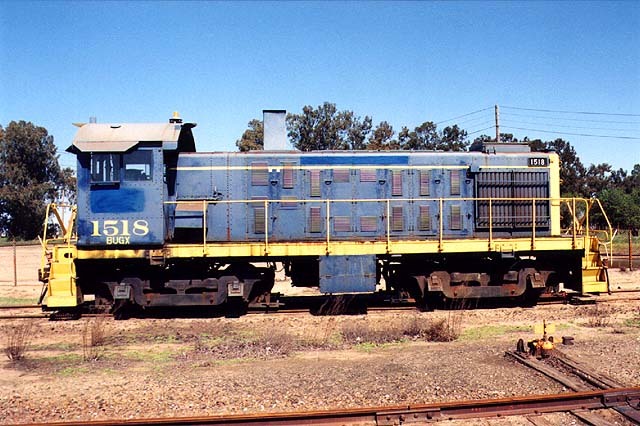 The Alco S4 is a former Santa Fe unit. Photo by Glenn Gehlke. 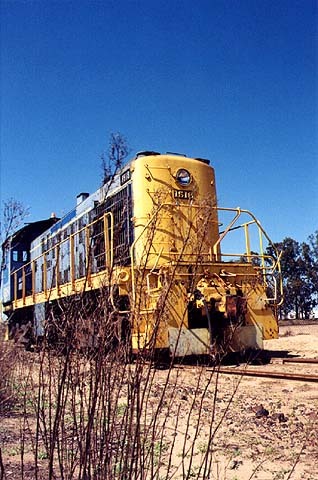 Du Pont 1518 works in the west yard in September 1998. 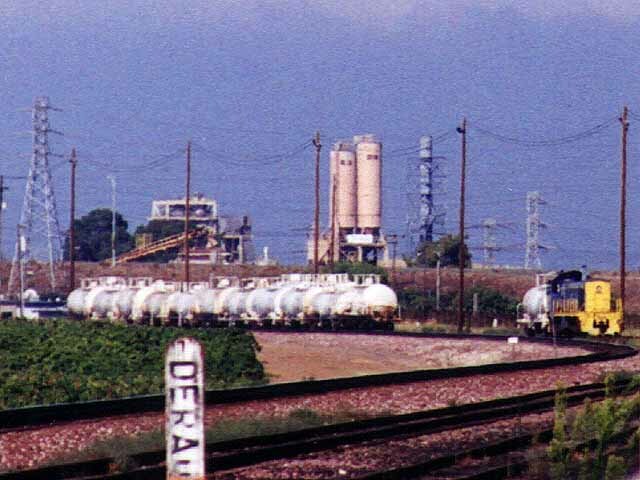 The yard once regularly held a dozen or more chemical tank cars. Today it is used by the BNSF to store empty four-runners (baretables) until they are needed in Richmond, Los Angeles or elsewhere. Photo by Glenn Gehlke. Another view of the west yard, taken in October 1998, this time looking northeast from the Shell gas station at the corner of Bridgehead Road and Highway 4. The foreground was once home to Bales Bait Shop; in March 1999 it became an ARCO gas station. Photo by Glenn Gehlke. 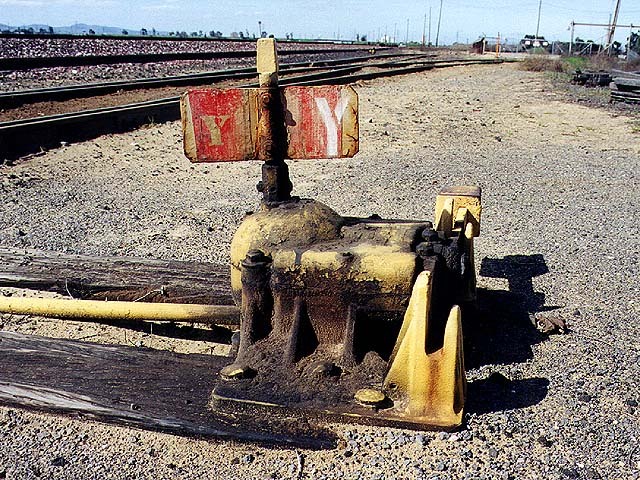 On March 25, 1999, the ex-Du Pont switcher is put out to pasture at the entrance to the plant gate. 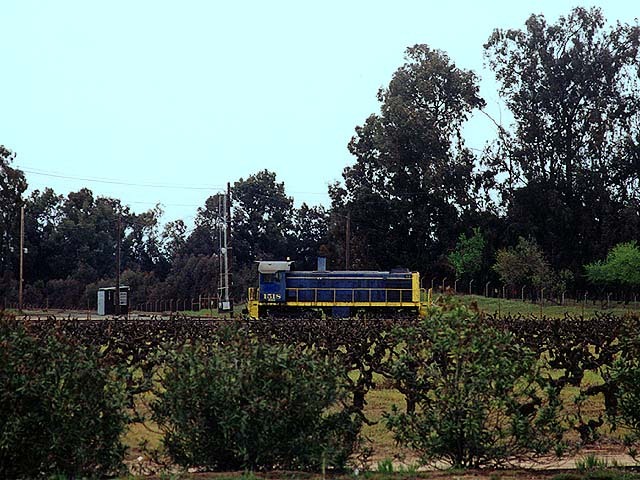 With new reporting marks -- BUGX 1518 -- the S4 sits all alone on the siding amid a field of wine grapes, waiting for delivery to its next owner. Photo by Roni Gehlke. On March 26, 1999, I take a walk over to the switcher for a closer look. As you can see, the S4 has been stripped of its former identity. The Du Pont logo is gone, as is the "Better Things for Better Living" slogan on the hood. Photo by Glenn Gehlke. A patch of weeds adds to the feeling of abandonment. I was so convinced that the S4 was going to be hauled away in the middle of the night that I wanted to be sure to get a "final photo" before it was gone forever. Two months after this picture was taken the switcher is still on the property, although it has now migrated to the west yard. Photo by Glenn Gehlke. With the cessation of operations at Du Pont it has become easier to visit the siding and yard area up close. So in February 1999 we did just that. 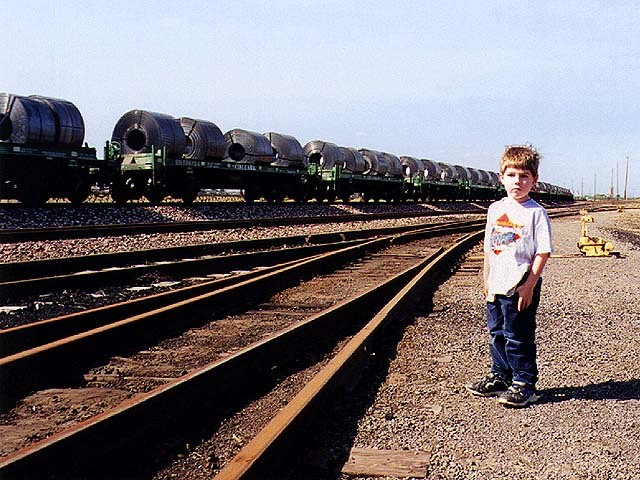 Here, our son Benjamin watches as a unit steel coil train makes its way west toward Pittsburg. Photo by Glenn Gehlke. At the west end of the west yard, we pause so Benji can empty his pockets of "treasures" he has collected on our walk -- a golf ball, a rusted spike or two and miscellaneous nuts and bolts from equipment long since departed. That's the Highway 160 overpass in the distance, which marks the entrance to East Antioch. 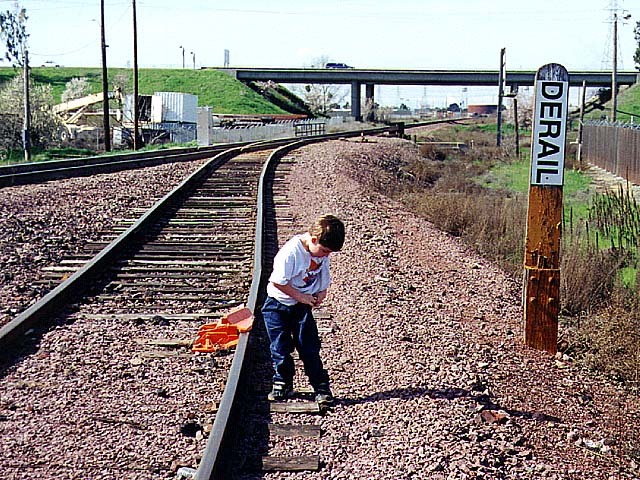 The funny-looking orange thing on the rail near Benji's foot is a derail, a key-operated metal boot that protects both siding and mainline alike from runaway cars and other unauthorized equipment movement. Think of it like the deadbolt lock on your front door. Photo by Glenn Gehlke. Here is a closeup of the switch stand that controls the east leg of the wye. Those handles weigh about 40 pounds, or so I've been told. Photo by Glenn Gehlke. 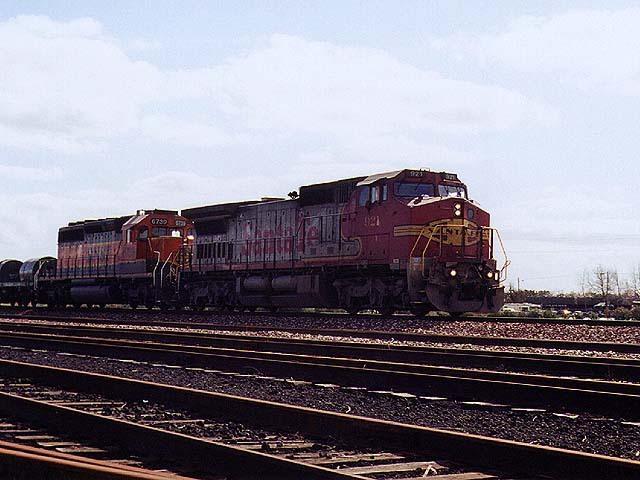 ATSF 921, a GE 8-40CW, leads an SD40-2 in Heritage I livery and a load of steel coils past the deserted east yard in February 1999. Photo by Glenn Gehlke. Old and older. A group of Burlington Northern SD40-2s powers an eastbound BNSF stack train around the bend, past the retired Du Pont S4 switcher, on March 26, 1999. Photo by Glenn Gehlke. 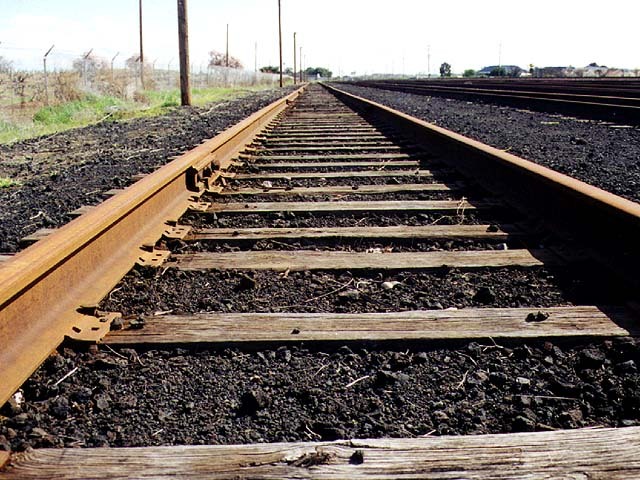 A long, lonely look along the rusted rails of Track 6 in the east yard. Photo by Glenn Gehlke. This page was last updated Wednesday, May 26, 1999 at 00:05 hrs.